When considering the introduction of staff training within your own organisation, it is important that you consider the job you are taking on. 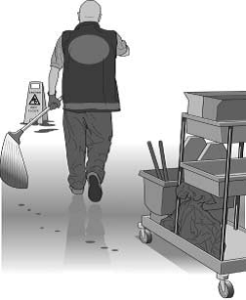 For instance, in order for cleaning operatives to properly identify the correct product to use on any given surface, they must have an understanding of why the product cleans, how the product can be applied, how the surface being cleaned can be affected and the standard that can be achieved. To be able to do this, knowledge of all of the various components that make up an efficient cleaning regime is imperative. Jangro has recently produced a new DVD called "Training for Results" which contains 7 seperate modules which include the following, Washroom Hygiene, Housekeeping, Kitchen Hygiene, Hard Floor Care, Carpet Cleaning, Health & Safety and Bio Hazards. The DVD normally sells for £25 but I am giving away one free to the first 50 people who contact me. The offer is only available to residents of the UK from a cleaning related background. Washroom Training Video, Housekeeping Training Video, Carpet Cleaning Training Video, Kitchen Cleaning Training Video, Hard Floor Training Video, Health & Safety Training Video, Bio-Hazards Training Video. Jangro is converting its Product Usage Guides from PDF into graphically rich videos with animation. These videos were created in MP4 format to make them easier to deploy to mobile devices. 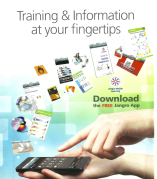 To get access to these videos on your smart phone via the Free Jangro App, see our contact details below. As well as winning its category in the Innovation Awards at the Cleaning Show in Birmingham, Jangro scooped the overall winner's trophy for its new Smartphone app which breaks down many of the barriers that prevent cleaners from being properly trained. Its new distance learning programme, called ‘Learning Management System’ (LMS).enables contract cleaning companies and organisations that directly employ cleaning staff, to train every employee on a range of specific cleaning tasks for only £0.99p, per person, per course.